The Main Menu has several sections as described below. View/Change DBFolder - to 'point' to a different database folder. You can have multiple databases in different folders. 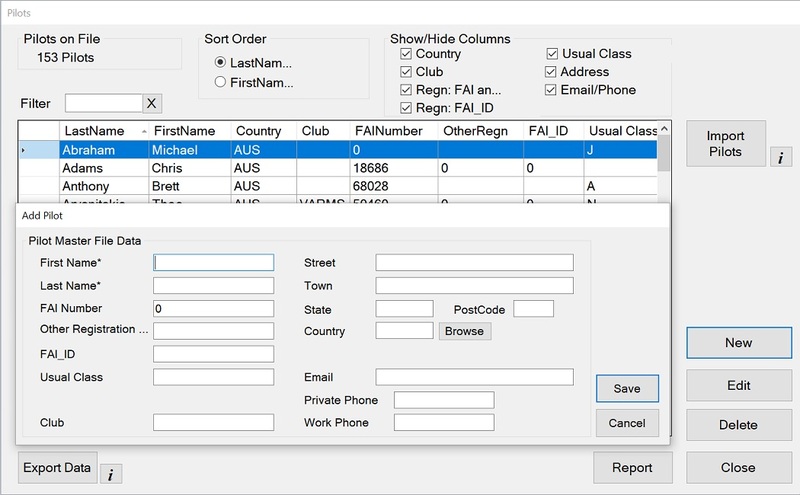 - right click to copy your database files to another location. Restore Size - all screens can be resized by dragging the borders. Click this button to restore all screens to their default sizes. Most screens can be resized by dragging the borders. The change is saved. 'Adjust Size' changes the size of ALL SCREENS by the percentage chosen. 'Restore Size' changes ALL SCREENS back to their default size. 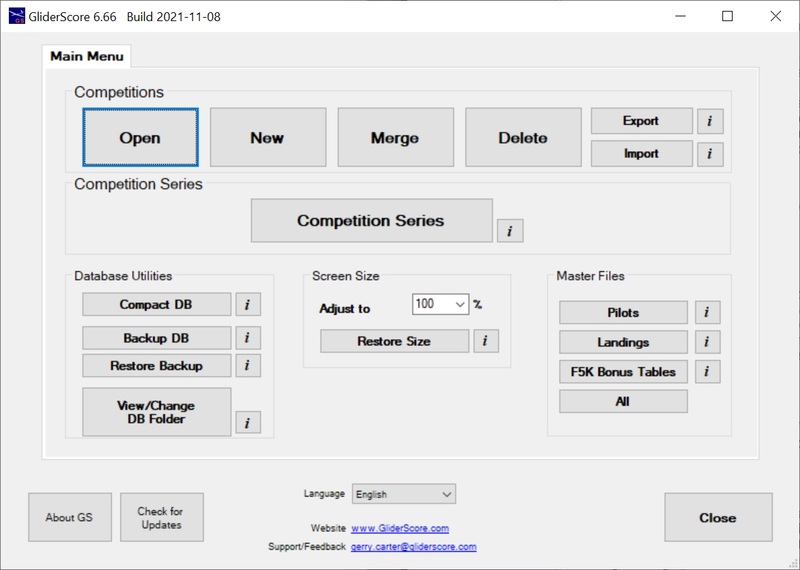 Export Pilots - to create a file Pilots.csv with all pilot data. This file can be used to import pilots into another database. Import Pilots - to bulk import Pilot names and other data from a file named C:\GliderScore6\Pilots.csv. Two proforma files, PilotsComma.csv and PilotsSemiColon.csv are included with the full program download. There is information in the ReadMe.txt file about how to use this facility. This table holds all country codes as determined by the International Olympic Committee. The FAI uses the same codes. When adding a country code to a pilot's record, one of these codes must be used. This is where you specify data to be encoded when using QRCodes on Score Cards. QRCodes are useful when using smartphones to gather scores. Third party software is required to do this. If entering scores manually, there is no need to do anything here. If using GliderScore's eScoring, you need to click the 'Reset for eScoring' button. It is possible to run GliderScore in a language other than English. Use the drop down box to select a different language (if installed). See the Translate tab for more details. 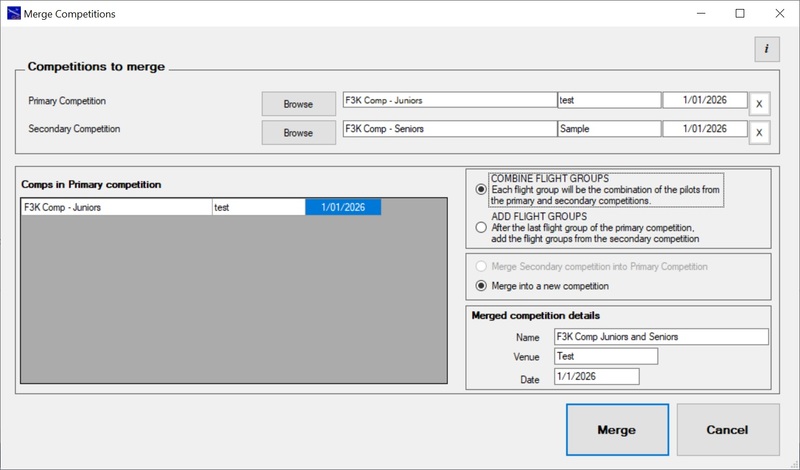 You can merge any two compatible competitions to create a new 'merged' competition. 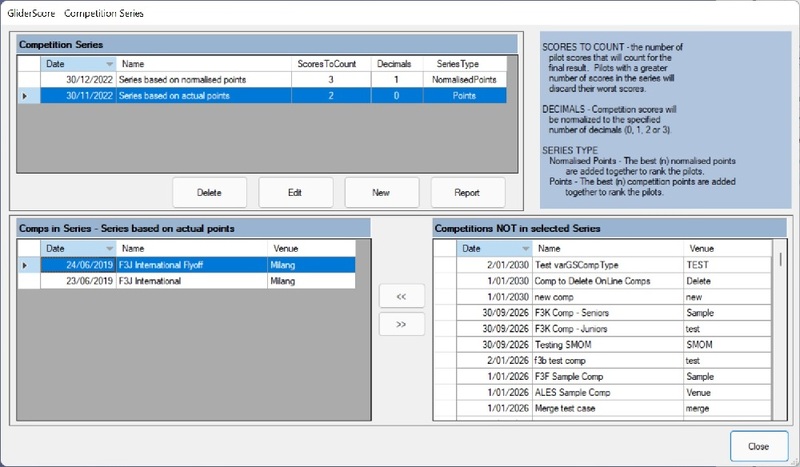 Compatible means that they must be identical in the task/s flown and in all the score calculation details. The merged competition is just like any other competition and all competition reports are available. Use the Merge function if you run two (one day) events over a weekend and need to combine the results. In the case of F3Q, the rounds across a whole season can be merged into one 'Master' competition. As competitions are run, they can be merged into the 'Master' competition and a progressive report produced. The Merge function runs in two separate ways according to the selections made. Select any two un-merged (Primary and Secondary) competitions to create a new merged competition. The original competitions remain unchanged. Select a merged (Primary) competition and an un-merged (Secondary) competition to merge the Secondary competition into the Primary competition. In this case the Secondary competition remains unchanged, but the Primary competition changes to include the results from both. Drop worst task scores (F3B) - for each task, the rounds will be added aftr the last round flown in each task of the Primary competition. Drop worst round scores (F3Q) - the rounds will be added after the last round flown in the Primary competition. You can export one or more competitions for sharing. 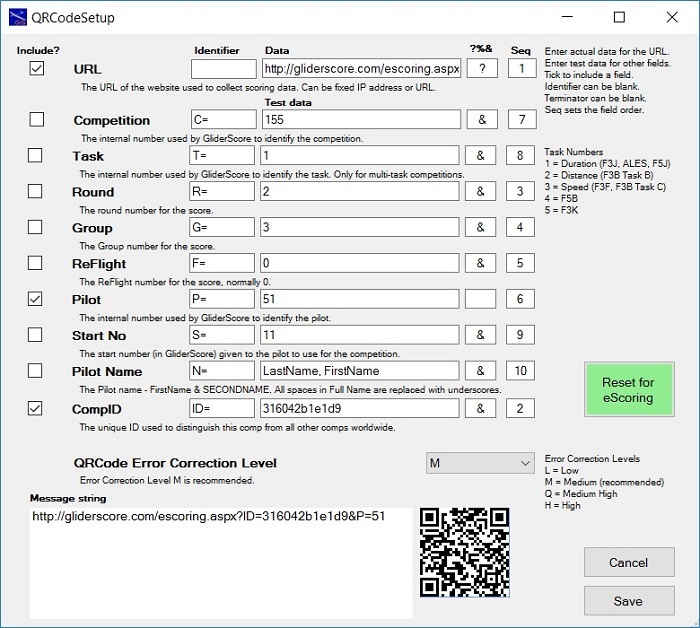 The file created is GliderScoreDownload.zip and contains the file GliderScoreDownload.txt (compressed). GliderScoreDownload.txt is the file GliderScoreDownload.mdb with the .mdb extension changed to .txt. The .zip file will be created in the same folder as the GliderScoreData.mdb file that was used to create it. Use this .zip file to share competitions with other users. The receiving user does not have to extract GliderScoreDownload.txt to be able to import competitions. The program does this automatically and deletes the extracted file when finished. 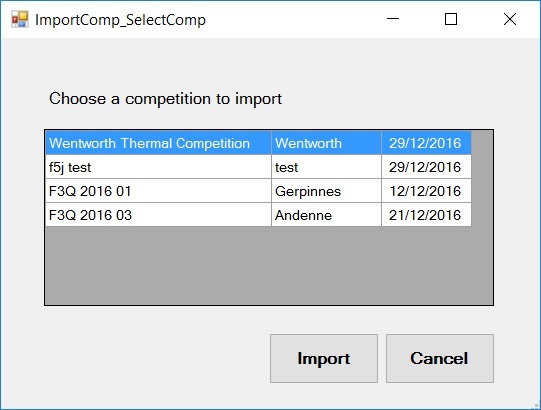 You can import competitions (one at a time) from a GliderScoreDownload.zip file. The .zip file must be located in the same folder as the destination database (GliderScoreData.mdb). There is no need to extract GliderScoreDownload.txt from the .zip file. GliderScore does that for you. If you are sent GliderScoreDownload.mdb . . .
Rename the file to GliderScoreDownload.txt. Create a .zip archive file named GliderScoreDownload.zip that contains the file GliderScoreDownload.txt. Go ahead and import the data. You can construct a competition series from your competitions. Useful where you run a series of (say) thermal comps over a season and need to work out the series winner. Competitions can be added to more than one series. A single competition can be included in a National, Regional and Local series all at the same time. As the competitions are run, they can be added to the series and a progressive report produced. Scores from the selected competitions are normalized to 1000 points (for each winner). Click the Report tab to see an example report. Watch the Competition Series video. This report can be run for 'All' or any combination of a selected 'Country', 'Club' and/or 'Class'. The default setting is 'All'. 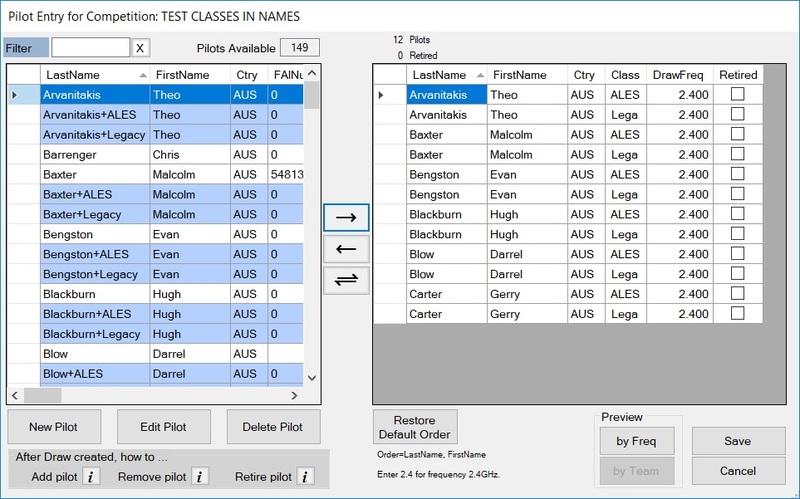 If selecting a particular Class, the Class used is the Class saved on the Pilot record. If the report is restricted by making a selection, the scores can be reported in one of two ways. - Restricted Scope Scoring selected - scores are re-calculated as if the only pilots who flew were the pilots within the selection. 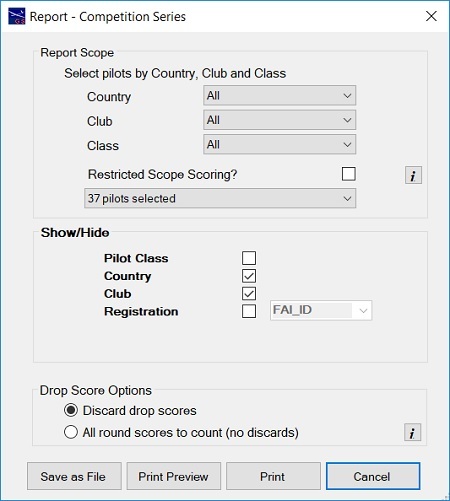 - Restricted Scope Scoring NOT selected - uses the same scores as for the 'All Pilots' version of the report. This example shows a competition series where four events have been flown, and the three best results of each pilot are counted. From the Main Menu you can access this screen to add new pilots, edit pilots or delete pilots. Pilots created here are entered into competitions from the competition setup screen. There are three fields for pilot registration. - FAI Number - this is the number given to a pilot by their National Association that is affiliated with the FAI. - Other Registration - this is any pilot registration number that is not related to the FAI. Note that the field 'Usual Frequency' shown in the video has since been deleted from the program. 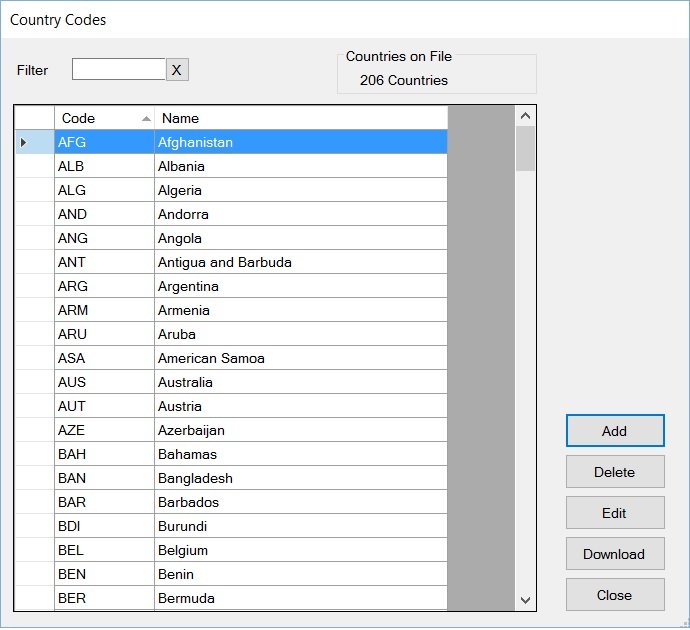 Note that the field 'Country Code' now has to be a code from the table 'Country Codes'. 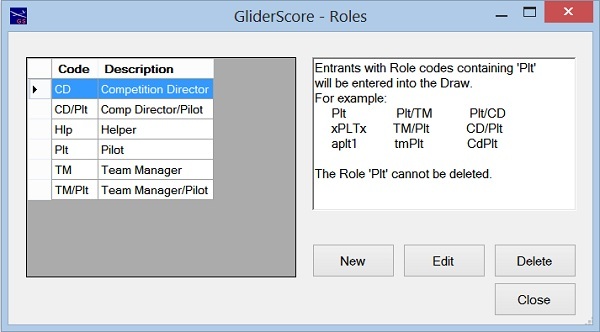 GliderScore supports competitions where a single pilot can enter to fly in a number of different classes and all classes fly the same task each round. To keep the pilot/class combinations separate for scoring and report purposes you need to set them up in a special way. Create a 'Pilot' entry for each pilot/class combination. GliderScore recognises the '+' symbol in the last name field and will process it accordingly. The Class field is automatically filled with the first four characters that follow the '+' symbol. All screens and reports that display the pilot class will show the name as just the name. In creating audio, a pilot class that is all capitals will be treated as separate letters. For example, +ALES would sound out each letter A...L...E...S, and not sound like beer (Ales). In other cases, like Anderson+Woody, these would be treated as separate words, Anderson, Woody. From the Main Menu you can access this screen to maintain your Landing Bonus tables. You can have as many as you like. Although the columns are headed Distance and Points, what you enter in each is up to you. It is important to know that the Scoring screen will only allow values that you put in the Distance column. 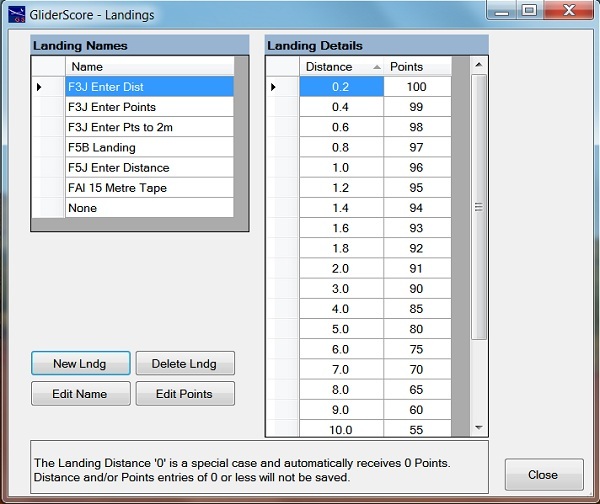 The program then adds the related Points to the pilot's score. There is nothing to stop you from having the same values in both columns. If you do this, what you enter in the Score Entry screen will equal the points given. There is no need to use Roles if you do not have a use for identification badges for officials. From the Main Menu you can access this screen to maintain your Roles table. You can define as many as you like. A Role describes the reasons why people may be on the competition flying field. Those without a role should not be there. The key role is Plt=Pilot. This role cannot be deleted. Other roles might be CD=Competition Director, TM=Team Manager, and so on. There can be a combined role such as Plt/TM=Pilot and Team Manager. Any Role code containing the letter sequence Plt always means a pilot to the system, and this person will be entered into the draw. Entrants with the following role code examples will all be taken to be pilots and may have other roles. Plt, Plt/TM, Plt/CD, TM/Plt. What are Roles used for? Roles are used when printing out identification Badges for those people who have a reason to be on the flying field. The badges show the role and name, and if a pilot, other information as well. When entering pilots, by using Roles, you are also able to enter officials as well. Note that a person might take on different Roles at different competitions. To use Roles you must tick the 'Use Roles' box on the Competition Setup screen. However, you can print identification badges for pilots even when 'Use Roles?' is not ticked. The Country Codes table lists all country codes as recognised by the International Olympic Committee (IOC). The FAI uses the IOC's list as the source for its country codes. When creating or updating a Pilot record, any entry in the Country Code field must first exist in this table. You will almost never need to make changes to this table but if you do, the table should always remain consistent with the IOC's codes. eScoring: If using GliderScore's eScoring system, you need to click on the 'Reset for eScoring' button so that the QRCode is configured correctly. Manual Score Entry: If entering scores manually, there is no need to do anything here. You can ignore it. Electronic Scoring Interface: QRCodes can embed exactly the data required for a system that gathers scores using smartphones. Use this screen to specify the URL used by the electronic score gathering software. 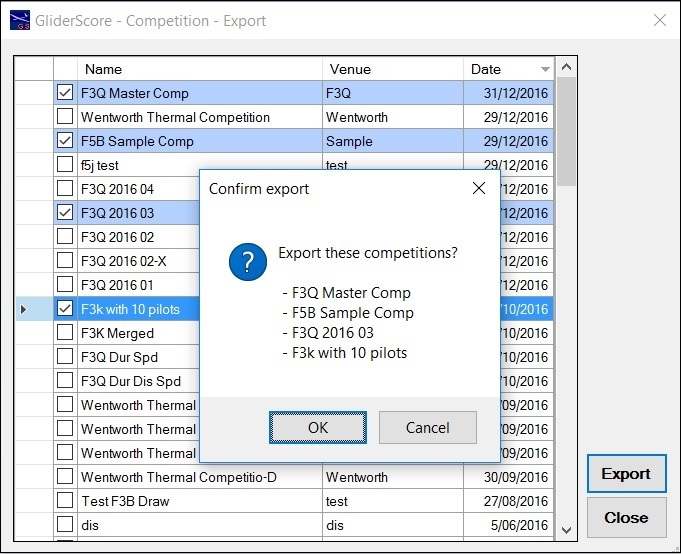 You can include or exclude exactly the fields that are required and in the order required by the score gathering software. Any changes made are instantly reflected in the 'Message string' box and the generated QRCode. You can check for correct encoding by scanning the QRCode directly from the screen.